Israel Is Forever: Special feature to the Calling Out Community, Posted July 21, 2015. Updated November 12, 2015. Canadian Prime Minister Stephen Harper announced on Tuesday, July 21 that negotiations toward an expanded and modernized Canada-Israel Free Trade Agreement (CIFTA) had completed. Harper’s office said in a statement that the updated CIFTA will notably provide expanded market access opportunities for agricultural, fish and seafood products through the reduction or elimination of Israeli tariffs on a large number of products, and duty-free access under tariff rate quotas for certain products. Four existing areas of the current CIFTA have been modernized, namely market access for goods, rules of origin, institutional provisions, and dispute settlement, according to the statement. In addition, seven new chapters have been included in the areas of trade facilitation, sanitary and phytosanitary measures, technical barriers to trade, intellectual property, electronic commerce, labor, and environment. This CIFTA will support Canadian businesses and investors, deepen trade and investment linkages, and further strengthen Canada’s bilateral relationship with Israel, said Harper’s office. Prime Minister Benjamin Netanyahu spoke to Harper on Tuesday evening, hours after the joint announcement was made, thanking him for his continued support of Israel which Harper recently reaffirmed on Yom Ha’atzmaut, Israel’s Independence Day. Canada is one of Israel’s closest friends. We deeply appreciate our extensive and deep cooperation with the Canadian government, which has flourished in recent years and of which the free trade agreement is but one example,” Netanyahu said. “This expanded and modernized agreement will further energize the trade between our countries to the benefit of both our peoples,” he added. 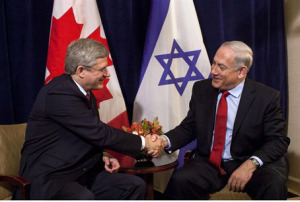 Harper continued to stand up for the Jewish state during last summer’s conflict in Gaza. The Canadian leader called on Canada’s allies and partners to recognize that Hamas’s terrorist acts “are unacceptable and that solidarity with Israel is the best way of stopping the conflict.” He also blamed Hamas for the heavy loss of civilian life in Gaza during the fighting. I am so thankful for our Prime Minister and his powerful leadership and support for Israel during this time. I believe firmly that, if we turn our back on Israel, God will turn His back on us. As long as we continue to support her against the Big Lies of the media against her, Canada will continue to be blessed to be a blessing to the rest of the world. Next PostThe Massive Rally …That Never Happened?